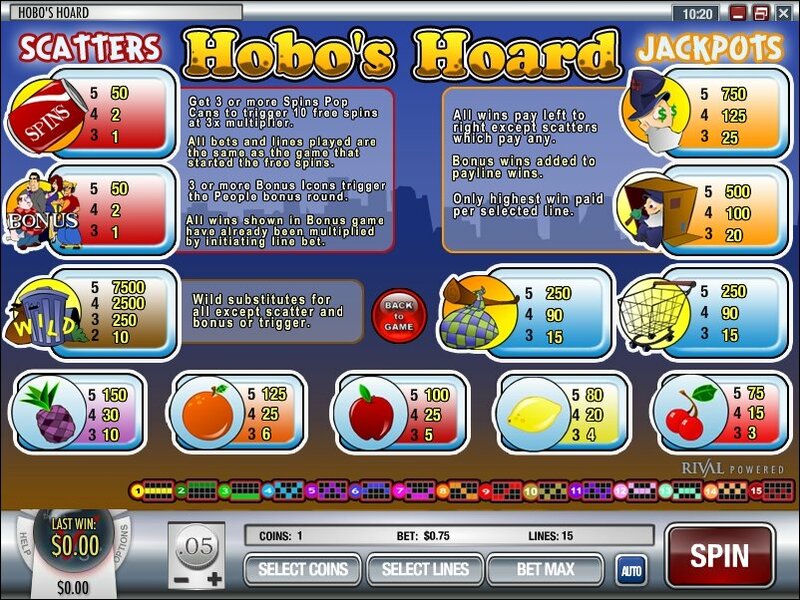 Overview: Hobo's Hoard is a 5 reel, 15 payline Slot machine. Hobo's Hoard has 2 Scatter Icons and one Wild Icon. The Trash Can Icon is wild. This icon will substitute for any other symbol to formwinning combinations, other than the Scatter Icon. The Bonus Icon is a Scatter Icon. If 3 of these icons appear on the Reels you willbe sent to the Pick Your Person Bonus Round These symbolsdo not need to appear in a sequence to trigger the bonus round aswell you do not need to be playing all Paylines. It can be anywhere on any of the five reels. The Spins Can Icon is a Scatter Icon. If 3 of these icons appear on the Reels youwill trigger 10 Free Spins. These symbols do not need toappear in a sequence to trigger the bonus round as well you do notneed to be playing all Paylines. It can be anywhere on any of the five reels. Note: You may wager 1 line up to 15 lines. Simply click on the Select Lines button toenable multiple paylines. You will only be paid on winningcombinations for enabled paylines, except for the Scatter Icons thatpay in any position. 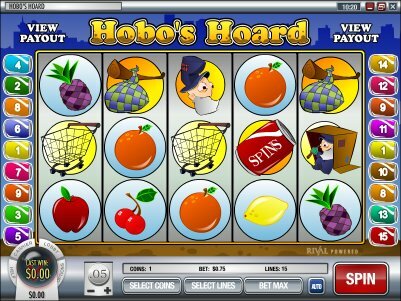 Similar Slots: If you like Hobo's Hoard, you might like these other Rival video slot machines: Fantasy Fortune, Reel Party, Secret Garden, Western Wilderness, Wheel of Cash, Winter Wonders.